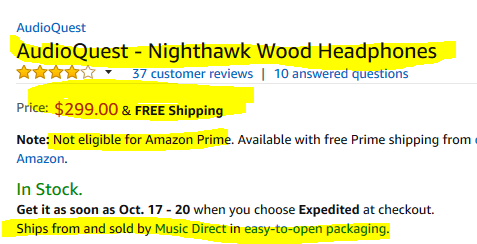 The new condition AudioQuest Nighthawk Wood Headphones are currently on sale for $299 with free shipping, sold by Music Direct through Amazon.com. They ship directly from Music Direct, and they are not Prime eligible. Per the listing, these ship in “easy to open packaging”. The Audio Quest website says they are an authorized dealer. The new condition price for the Monoprice M1060 planar-magnetic open-back over-ear headphones is $300 but if you are comfortable with used, used prices begin at $224~ in “Used – Good” condition (cosmetic imperfections, missing accessories, new earpads, damaged original packaging) or $239~ in “Used – Very Good” condition, both by Amazon Warehouse Deals actual. PS: there are on the same listing as the M560, so if you are reading reviews or answered questions, keep that mind as Amazon intermingles them. The lightweight AmazonBasics closed-back on-ear in the white color scheme are currently available in “Used – Like New” condition (damaged original packaging) for $9 by Amazon Warehouse Deals actual. They come with a very basic pouch. These are a great bang for the buck for modern music genres with a reasonably non-obnoxious bass emphasis.